My name is Steve Bunting and I am a professional freelance FOH / Monitors live sound engineer, RF / systems technician and audio consultant specialising in live music mixing. I am based in Stockholm, Sweden but maintain close ties to the UK and travel worldwide. I offer a professional approach to all live sound applications, with considerable experience drawn from a diverse range of events including bands, clubs, tours, functions, conferences, theatre, orchestral, comedy, seminars and festivals in a variety of venues. I have hands-on experience of an extensive range of professional audio equipment and a thorough grounding in audio engineering theory but come from a musical background so smoothly combine the technical and creative aspects of audio production. My extensive contacts in the industry permit me to select the highest quality and best-suited crew and suppliers for a particular event. Above all, I take great pride in my work and have a great deal of enthusiasm for my job. I hope that this website will give you an idea of my experience and capabilities. Please feel free to learn more about what I can do for you by taking a look around. Thanks for taking the time to visit, and please feel free to contact me. 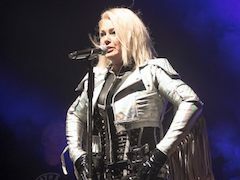 I am currently in the middle of Kim Wilde's first headline UK tour in over 30 years, in my normal position at stage left mixing monitors, with the familiar combination of DiGiCo console (SD10) and Sennheiser IEMs (G3). Myself and the FOH engineer Sean, who is using an SD9, are sharing an SD-Rack. The tour, which runs for the whole of April, is in support of the new 'Here Come The Aliens' album, released in March 2018, which has received a lot of support from BBC Radio 2. There will be more to come this year and next, starting with a German tour in October and a Dutch tour in November 2018. Last week, I finished a short tour around Germany and Scandinavia with bass virtuoso Mark King and Level 42. We visited a variety of places including a club in Cologne, an in-the-round concert hall in Copenhagen and an old slaughterhouse in Malmo! The band are all on in-ears and as part of the backline, we carried a DiGiCo SD10-24, Sennheiser 2000 series IEMs and a complete stage package and line system. Even with a drum kit that takes up 19 channels, it still all fit in the bus trailer! Today I am at the Scala in London, the final date of a mini club tour with Megan McKenna, reality TV star and country music singer. With a 5-piece live band, we are touring a small audio package comprised of DiGiCo SD10 and Sennheiser G3 IEMs, as well as Avid Profile FOH console and Martin Audio PA and of course, the blinged-up vocal radio microphone featuring pink crystals! Judging by the reception we've seen this week, we expect to see much more of her in the future!